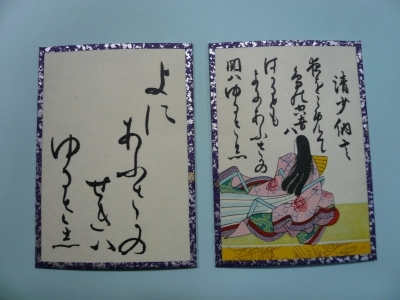 Hyakunin isshu is a kind of karuta, which is collected 100 waka*1 poems composed by 100 poets. As is karuta, there are yomifuda and torifuda, too. The yomifuda of hyakunin isshu are written full poet, and torifuda have only second half. The ordinary karuta has pictures on the torifuda, but it has figure of poets on the yomifuda. Sei Syonagon has written this poem. I do not see you any way. She has written a poem about Tactics of men and women. Oosakanoseki means an assignation or a clandestine [secret] meeting of lovers. *1 waka: it is a 31-syllable Japanese poem which is often divided in 2 parts, kaminoku (the first three lines of waka) and shimonoku (the last two lines of waka).